Is the central hub and policy holder of all matters pertaining to student discipline in the Los Angeles Unified School District. We strive to ensure fair and equitable practices in relation to expulsion proceedings and advocate for the lawful application of State and Federal laws and District policies within the entire spectrum of discipline. It is our expressed goal to provide expert guidance to schools and extensive rehabilitation services for students. Provide updated State and Federal laws and regulations, District policies, Board mandates, and legislation relating to student discipline. Develop District student discipline policies and procedures that are aligned with laws, regulations, rules, and mandates, including suspensions, opportunity transfers, expulsions, reinstatements, and admissions of other districts’ expellees. Process expulsion recommendations and admission applications by conducting State-mandated hearings, including expulsion, admission, revocation, and reinstatement hearings. 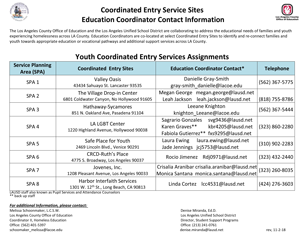 Provide State-mandated AB 922 expulsion support services to all expelled students. Provide District-wide trainings to central, Local District, and school staff regarding student discipline. Pursuant to E.C. Section 48919, any student expelled by the LAUSD Board of Education may appeal the expulsion, within thirty (30) days from the date of the Board’s action, to the Los Angeles County Board of Education. For questions regarding the appeal process, please call (562) 922-6234. Please contact the MiSiS Help Line for any issues at (213) 241-5200. If a referral has been created by mistake and the Principal is requesting that the record be removed, please click on the link to print the required form.